The Moto X may just be the most useful smartphone on the market. Casting aside the endless quest for yet greater specks, Motorola, under the ownership of Google, sought to combine powerful, low energy hardware with innovative and optimised software. The results are impressive! 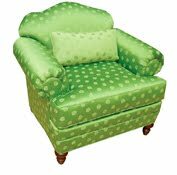 First, we can't neglect to discuss the design. 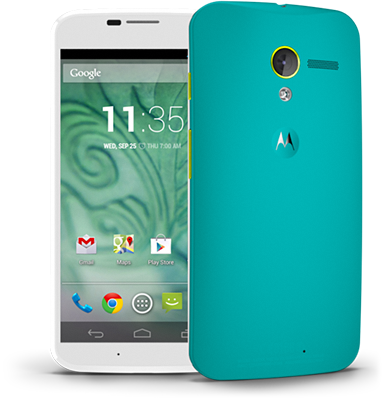 The fact that you can design your own through the Moto Maker site, which is now available for all major US carriers. You can choose from a multitude of color combinations and then have your custom phone assembled and shipped to your home. This is an industry first, but it surely won't be the last. Having the ability to order your own custom designed device is quite an experience. I ordered the GSM Developer Edition, which only comes with the black front and white back, but it is still a beautiful phone none the less. The size is the perfect combination of 4.7" screen and comfortable in the hand and pocket body. The build quality is solid, without gaps, overlaps, or "creaky" loose pieces. While all the world is going crazy over the insanely powerful Snapdragon 800 processor found in the likes of the Galaxy Note 3 and the LG G2, Motorola decided to put together their own system for the Moto X. Unfortunately, when the X was announced, most people only heard "dual core" when everyone else was saying "quad." Don't fall into this trap. The X is a solid, speedy performer. In everything I've thrown at it, it has proven to be quite snappy and responsive. So why did Motorola build the X8 computing system, sending spec heads into confusion? To go along with their new concept of software. This is my favorite part of the Moto X. Motorola chose to stick with an almost vanilla version of Andriod 4.2.2 (now most carrier models are on 4.4.2). This in itself is awesome. While Samsung and LG are cramming every unnecessary feature they can fit in their phones, Motorola started with the proven design of stock Android and then added features that we really need. This feature is so useful, you will wonder how no one thought of it before. How many times a day do you pull your phone out of your pocket and press the power button, waking the phone and turning on the screen, just to check the time or if you have any messages? Be honest, the number is higher than any of us like to admit. We can't stand the thought of missing out on something! Motorola noticed this trend and decided to do something about it, Active Display. 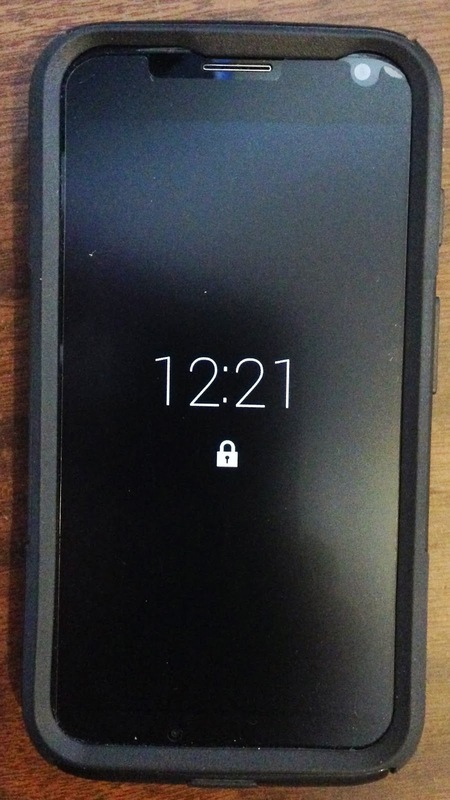 Utilizing one of those low power cores, notifications are displayed on the screen periodically (breathing) while the phone is sitting out or when pulled out of the pocket. From here, one can choose to open or dismiss. The first thought most would have, is how does this affect battery life? Well the combination of low power core and an AMOLED display that only powers the active pixels, is a huge energy saver over the conventional power on the phone, check, and then power off method. This is my favorite feature. I love being able to simply pull the phone about half way out of my pocket, see the time and any notifications, and then slip it back in, without touching any buttons. Amazingly convenient. Here is another handy feature. Hop in the car and start driving. Moto X knows your driving. Okay, again it sounds kind of creepy, but it's very useful. Recieve a text and the X announces who it's from. Want to reply, it gives you the option. I have had whole conversations while driving, eyes still on the road, hands on the wheel, safe and convenient. It also works the same with phone calls. Driving mode is the one I use most, but there is also one for meetings where you can mute interruptions and one for sleeping so that you can, well, sleep. Ever wish you could receive and respond to text messages from your computer browser? Now you can, with the Motorola Connect Chrome browser extension. Works much like the Mighty Text app and extension I have used previously. Comes in handy. When it comes to software, the one question we all have is, "Will this thing get updated?!" Thankfully, Motorola has made a point to quickly administer updates to the X. Originally shipping with 4.2.2 Jelly bean, mine is already equipped with the latest 4.4.2 KitKat. This is something I wish all manufactures would strive for. No one likes to use lock screen passwords, pins, or patterns. We want security but, it can be such a hassle to enter one every time you want to unlock your phone. Motorola has alleviated some of this with Active Display and the ability to see time and notifications without unlocking. For those times you need to get through, we have Motorola Skip. It is a wearable magnetic NFC device that wakes and unlocks the phone with only a tap on the back. Personally I have found it to be a bit touchy, but useful. I use the Skip Dots more. Three Skip Dot stickers come with the Skip that are capable of unlocking the phone once it is awake. I placed one of these on an old rewards card that I found in my wallet. Placing this in my pocket or in the back of my wallet it allows me to unlock with just a tap. The 10 megapixel camera has been the one sore spot of the X, though it has improved greatly from the initial release. Every phone manufacturer claims that their latest flagship phone takes the best pictures, and Motorola is no different. While results seem to vary, I personally find the camera to be adequate. No one is going to mistake you for a professional photographer, but the pictures are fine for sharing to all of your social media sites. The one feature I do love about the camera, is how you can activate it from any state by two flicks of the wrist. Kids move fast. No matter what I'm doing with my phone, I can quickly activate and operate the camera. Now if there was only a way to get all three kids to stand straight and smile at the same time. This is always the big question on everyone's mind. "Hows the battery life?" Motorola claims all day (24hr?) battery life with mixed use. While mileage will vary according to individual use, I have found that I can easily make it from morning to bedtime without issue. If it's not apparent already, I couldn't be happier with my Moto X. Motorola hit the sweet spot with their combination of hardware and software. Active Display, Touchless Control, and Motorola Assist, have changed the way I interact with my smartphone. I love the vanilla Android with the addition of only a few useful touches. Performance and battery life more than meet my needs. All in all, I recommend this phone to everyone who may be sitting on the fence, trying to make the life altering decision of which new phone to get.